Click here for more info on sponsorship opportunities! 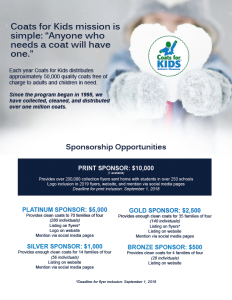 Through Coats for Kids, we were able to give families warm coats so that they could devote their resources to other needs, such as heating their homes and buying food. I believe that in so many ways, Anton’s Cleaners is an unsung hero to so many people.